Why do standards matter for equity? 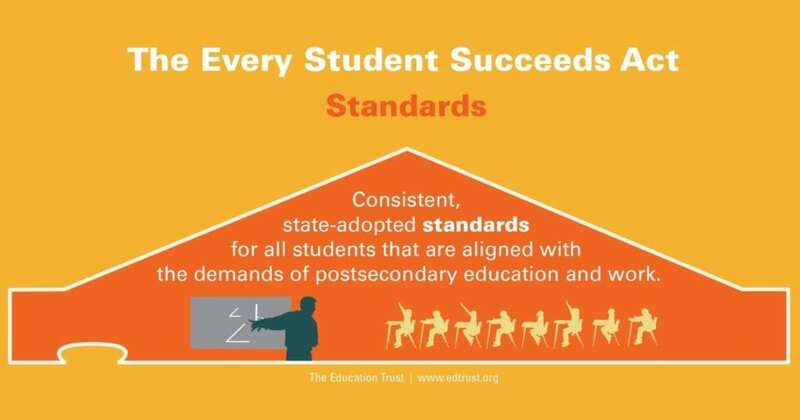 Academic standards are shared expectations for what all students need to know and be able to do at each grade level. Consistent, high expectations linked to the demands of postsecondary education are critical for ensuring that all students — not just some — get access to meaningful learning opportunities that prepare them for success after high school. States have to demonstrate that they’ve adopted challenging academic standards for all public school students in math, reading/language arts, and science. These standards must be aligned with both the entrance requirements for credit-bearing coursework in the state’s public higher education system and the state’s career and technical education standards. States must demonstrate that they’ve adopted standards for English-language proficiency for English learners that are aligned with the state’s academic standards. States can use alternate academic achievement standards for students with the most significant cognitive disabilities, but the standards must still be rigorous enough to prepare students for postsecondary education or employment. How will states demonstrate that their standards are aligned to entrance requirements for credit-bearing coursework for higher education? Whose entrance requirements for credit-bearing coursework will states align standards to? Community colleges? Four-year institutions? How will states and districts1 ensure that educators have the supports and instructional resources they need to teach all students to college- and career-ready standards? How will states and districts monitor how well standards are being implemented in high- versus low-poverty schools?